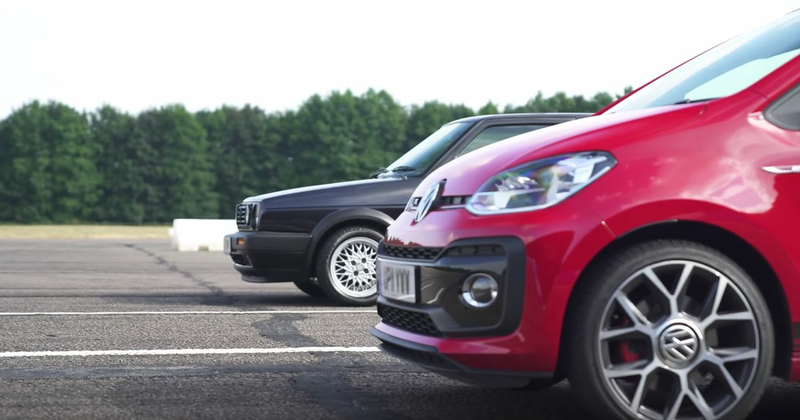 The Mk2 Golf GTI and the much newer Up GTI have roughly the same power output, but which will come out on top in a drag race? Over the last few months, we’ve seen Car Wow drag race a massive variety of fast cars. There have been hot hatch battles, supercar showdowns, and even a face-off featuring two hilariously powerful limos. The latest effort is a little less dramatic, however. In fact, it is - in a way - quite a relaxing race to watch. In one corner we have the VW Up GTI and in the other an eight-valve Mk2 Golf GTI. And the reason for the pairing simple: they have around the same power output. The difference is the Up GTI uses a much smaller engine - a 1.0-litre inline-three turbo versus the Golf’s naturally-aspirated 1.8-litre inline-four. The Up is slightly heavier, but it has time on its side - it’s likely a few of the Golf’s horses will have cantered away over its considerably longer life. Have a watch of the video above, then let us know in the comments whether or not it went the way you were expecting!